To follow this guide it is essential that you have already registered a company. If you have not then please see the help file section about founding a company then return back to this guide. At this stage you should have started a company but done nothing else yet! If you have, do not panic just read on and try to do the bits you have missed. Remember, this is only a guide and where this guide uses a specific speciality it does not matter if you choose a different one. Before we can start to build we could do with getting some more money. There are a few ways we can get more cash. The quickest right now is to take a loan. I would suggest reading this guide watching the attached Video then getting on with your very own first building. 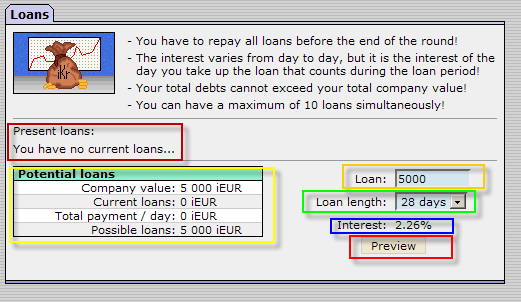 On the main menu located down the left hand side you will find loan located under the section headed as The Bank. Press this option and you should then get the screen shown on the right. On this screen you can see any loans you already have. This is the deep red box, at this stage you have no loans. 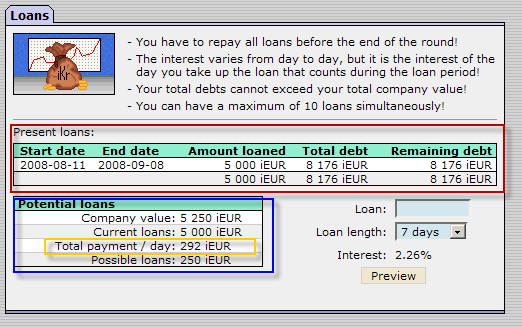 The yellow box shows the loans you could potentially take, at the beginning of the round your initial company value is 5000 so you can borrow 5000. The amount you can borrow is equal to current loans (this is the amount borrowed not amount owed) less your company value. The orange box is where you can choose how much to borrow, we will ask for 5000. The green box is where you can choose the amount of time you can want to take the loan over. Later in the game you may choose to go for shorter periods. For now please take the loan for 28 days. The blue box shows the interest rate. Later in the game we would avoid rates of above 2.5%. However at the moment we have no choice we need the loan and will take the rate being offered. 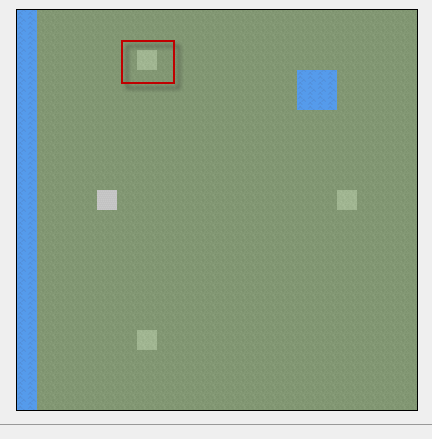 Finally, please press the preview button in the red box. The screen you should now be seeing shows data about the loan you are about to take. The red box shows the date and the blue box has a button called take the loan. This is where you would review and decide if you can afford to take the loan. In our case providing you have not started after 17:00 and you follow the guide fully you should be able to pay the loan off so take it. The info in the red box shows info about amount borrowed interest in total and interest per day and total to be paid in full. 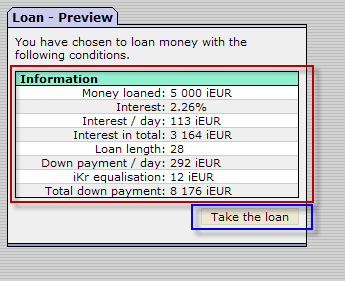 Notice the red box now shows the details of the loan you have just taken. Blue box shows the potential loans and as you have just made money your company value has increased by 250 this means you could if you wished take an additional 250 in loans, we wont as we don't need it.... but you could. the important part for us is the yellow box as this shows how much we will need to pay at midnight. Congratulations, you just took your first loan. Right there are lots of different ways to start and as you progress you will find the start that best suits you. For now we will use a good solid starting strategy and build 2 factories from your speciality. 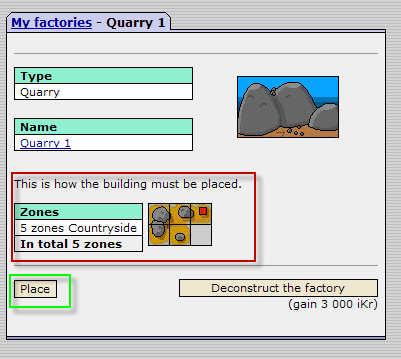 Mine is stone so I will do a stone quarry. First thing you need to do is go to the factories page use menu on left. 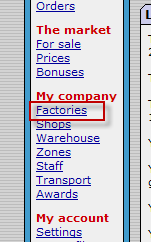 Once you have selected this you will land on the factories page as shown here. Next you will need to select the Build new factory button. Here we have only shown the section from the list that we are interested in. 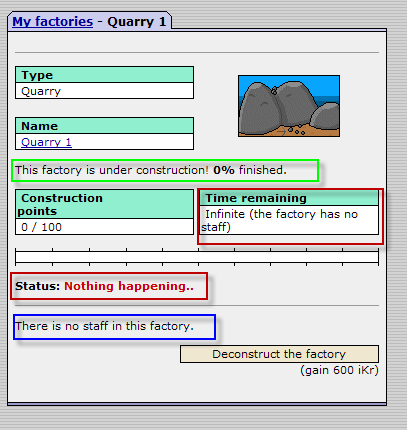 If you click on the line with the factory you want you should then get to this next screen shot. At this stage you need to take notice of the information provided specifically in the red box as this says what zones we need the shape we need them in and where to place them. In this case we need 5 zones in 2 line 3 on top and 2 below lined up to the left. These zones are needed in a country side area. Buildings cannot be rotated at all. Time to get our first zones, for now this bit is free as we will be given our first 10 zones free of charge, the procedure is still the same as buying zones. Note: Since NU round 5 - 2013, you can purchase zones whilst placing the building. This feature has also been available on the US server for a while. Firstly find the zones menu item on the left. This screen shot displays info about the zones we already own and allows us to buy or sell zones. So go ahead and select the Purchase zones button. On this map view we can see the red boxes are showing light green zones which denote country side zones. 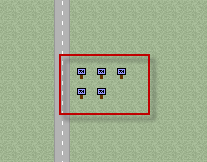 Having selected a light green zone you will have zoomed into a detailed map view of the country side. 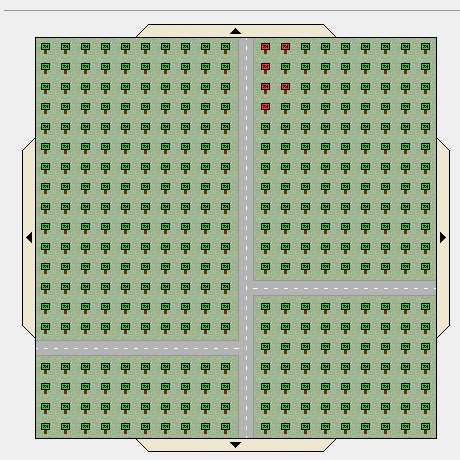 If all you see is red for sale signs then you did not click a light green zone you got a dark green one which is not yet open for play. 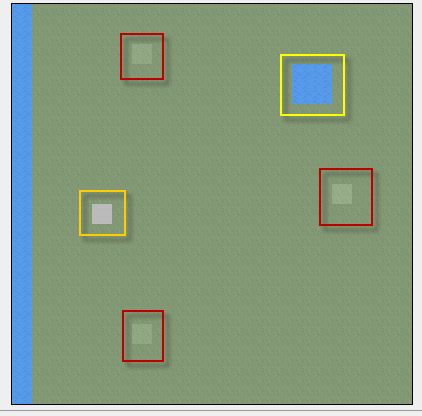 On this map you should hopefully see some road and green and red flags, you might also see other peoples buildings. We now need to remember the shape of zones we need for our building. This is very important as our building CAN NOT be placed on any zones that are wrong shape, this means you can not turn your building to make it fit. As can be seen when you select your zones to build on they turn the flag yellow. 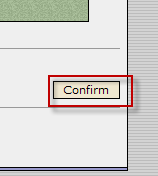 When you are happy with your zone selection press the continue button. At this stage it is worth pointing out that we really should try to build with a connection to a road, This means at least one of the selected zones should touch a road it can be on any side and even on a corner of the zone so long as it touches the road. This will give your building a 10% road bonus. Having hit continue you will now have landed on a page summarising the purchase you are about to make later in the game if you can not afford the zones this page will show you how short you are. At this stage as this is within our first 10 zones we have not got to pay a thing. Yes that is correct the first 10 zones are a gift from the city to get you started on your way. Please note that after this free gift you will have to pay for zones and the price increases with every zone bought!! For now go ahead and press create order. So now it's time to read about how to place your building onto the zones you just bought and then when the 10 min click is done you can get on with it. It is that time again when you need the left menu (did you notice all the main game actions you need are on the left) Please select factories. Now you should be seeing a screen like the shot above with your factory on it in this case it is our Quarry. As can be seen it is not producing and this is because we have not placed it yet!!!! so click on the line where it says the factory name. This next screen is showing you a number of things mainly the shape you need for your zones and the location i.e. Country side city or water, as we have already looked at this page and bought our zones you can press the place button. Then from the map on this next screen select the area you bought your zones in. Here you should now see the detailed map and on it there should be some grey flags which mark the zones you bought. If you do not see the grey flags check this is the area you were in when you bought your zones and remember it has to have been past a 10 min click for your order for zones to have been processed. 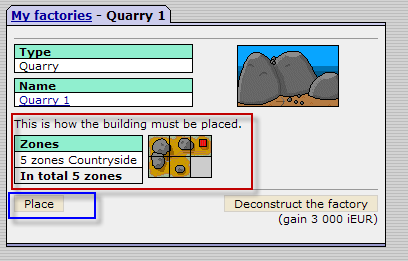 Note: Since NU round 5 - 2013, at this stage you can purchase zones you do not already own by placing the building and clicking 'Buy Zones'. This feature has existed on the US server for some time. 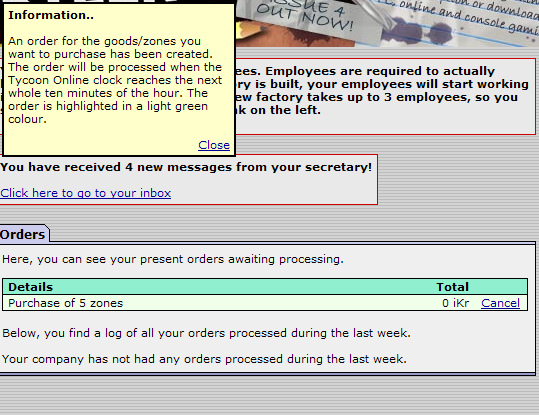 If you are sure you placed your order and you are in the right area then check the orders tab and see if your order was processed. 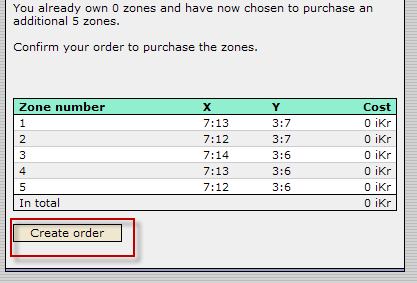 If some one else tried to buy the same zones they may have got them quicker than you. Right now, you're all done, your first building is up and running!!!!!! 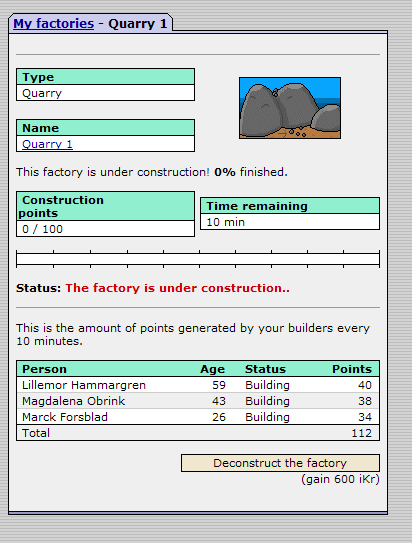 Well almost as this screen shot shows you have a factory being built however it has no staff yet so nothing is happening! Back to the left hand menu and for this exercise when I tell you to repeat until you have 3 staff. This is where the repeat starts. 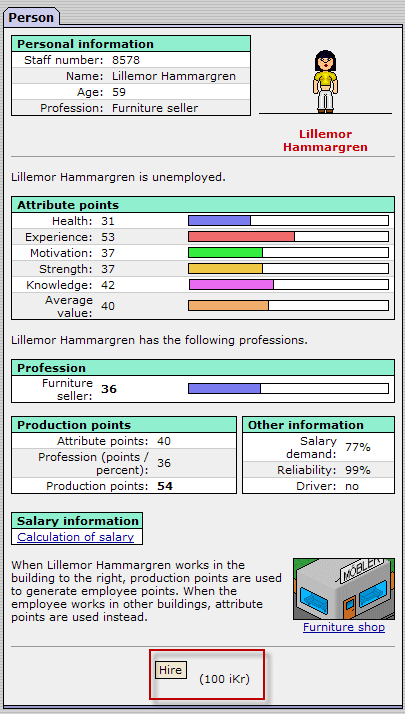 Later when you own some staff this screen will show you them for now we are interested in the Unemployed people button. This is where the fun begins as there are so many different ways of choosing what staff to employ. This guide is not about the intricacies of choosing staff and why some of us do it differently ( there will be a guide devoted to staff later). For now remember one thing any person can work in any factory, shop or later office. 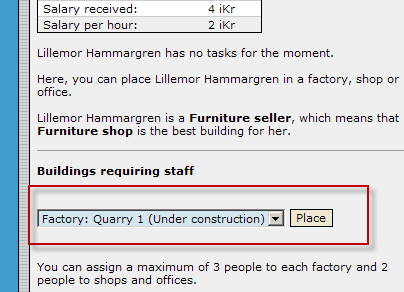 You can use the drop down box to filter staff by type if you wish to choose one trained for your factory or shop ect. 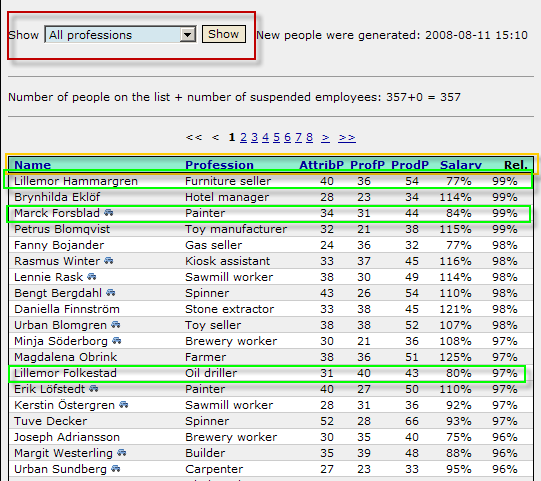 You can also filter the list of staff by column heading as in the orange bordered box above. the green boxes show the ones I am buying now. Remember we can retrain these guys later to do the profession of our choice. so click on the one you want to hire. When you have 3 staff members the staff front page should look a little like this now just click on one of your staff..
Now we need to place this person into our factory this can be done with the drop down menu that I have boxed out. At the moment we only have one factory so it is the only one on the list. Please place all 3 of your staff in the factory. Please not only your first 2 factories build quick , shops take normal time.. This page was last modified on 1 November 2014, at 23:30. This page has been accessed 93,550 times.